I like to post about things as they happen (being a man-of-the-moment kind of guy), so here’s one about the snow we had back in early February. emerging at the far end, passing the small copse and looking out over the fields, while ahead and below the Priory slowly reveals itself. Unlike some, I love snow. I love playing in it and I love the transformation of the ordinary into something crisp and mint and pure. But I don’t love what it can do. 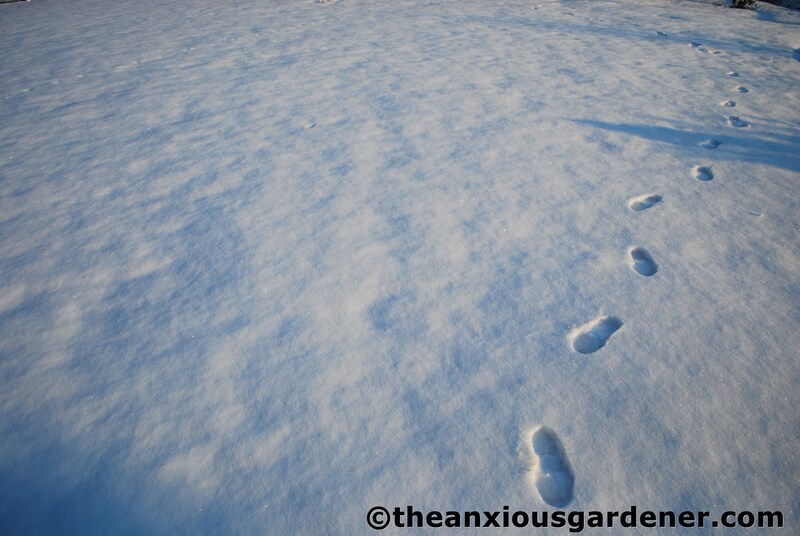 As I no longer live up on the ridge above the estate, I can’t go down to the Priory every day to check for rabbit incursions, or refill the bird feeders, or check there isn’t a burst pipe in the house … and that heavy snow isn’t damaging any plants. One of two venerable yuccas in the long borders. I'm not overly fond of them but it was still sad to lose three stout stems to the weight of snow. 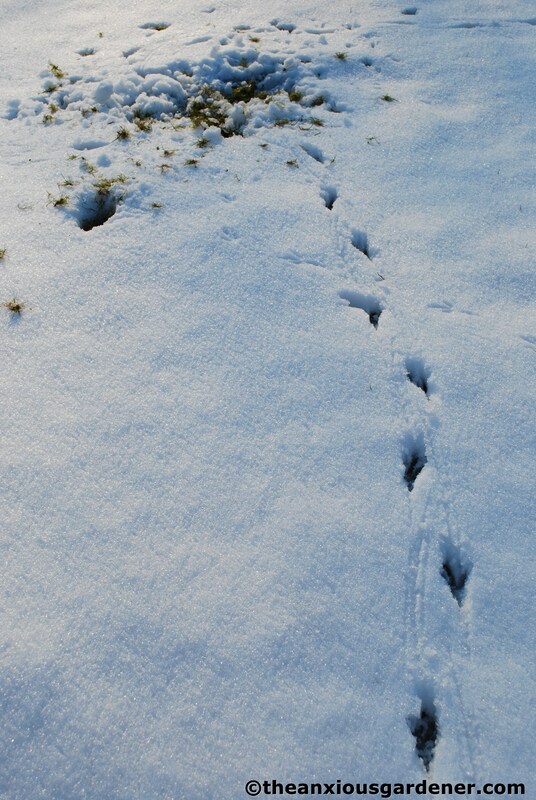 … and this the fox, trotting across the meadow, in search of pheasant. And this, this, (splutters with rage) is rabbit. I was able to follow the tracks to a small hole in the netting fence and block it off. Ha! (Just hope I didn’t fence it in, rather than fence it out). 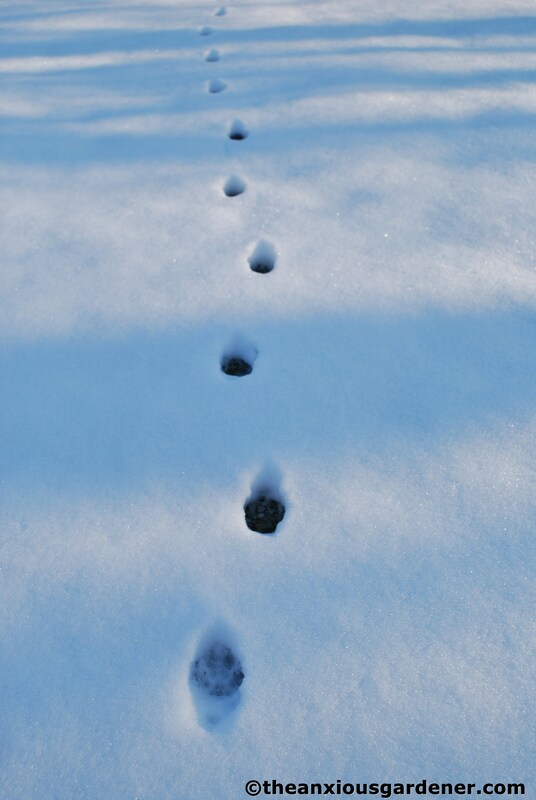 Curiously, the more I walked around the house, the more human footsteps I found. On each circuit of the gardens, I discovered more. 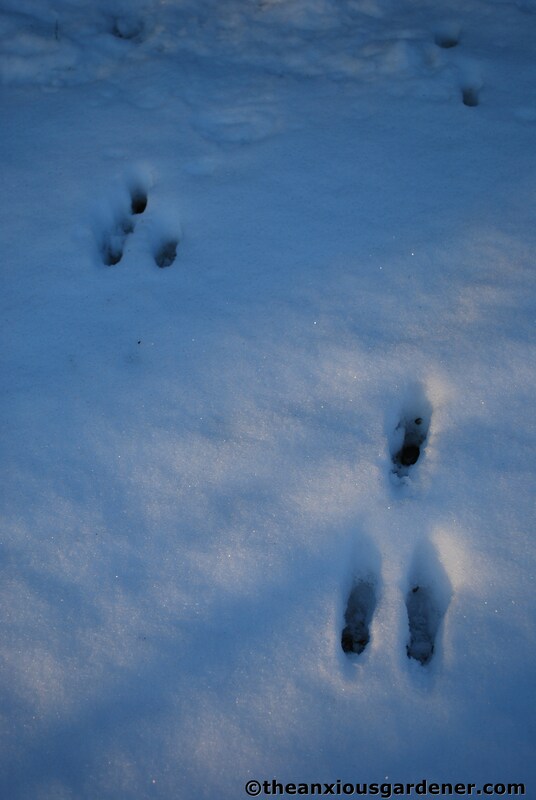 Perhaps someone was following me? Or perhaps there was a whole gang of burglars prowling about? I shall need to be on my guard and be extra vigilant. And then worryingly, I found irrefutable proof of the legendary, fearsome Lizard Man of Sussex; traipsing across the lawns with his anaconda-like tail, trailing behind him. Glad I didn’t meet him – shudder. Either that or they were formed by me pushing a wheel-barrow. Actually, thinking about it, it was probably the latter. 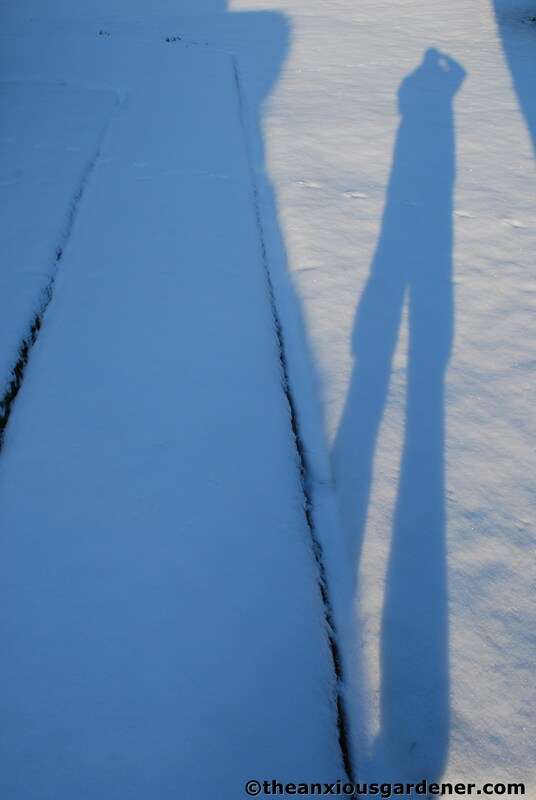 The low winter sun makes me extraordinarily tall – which is satisfying. 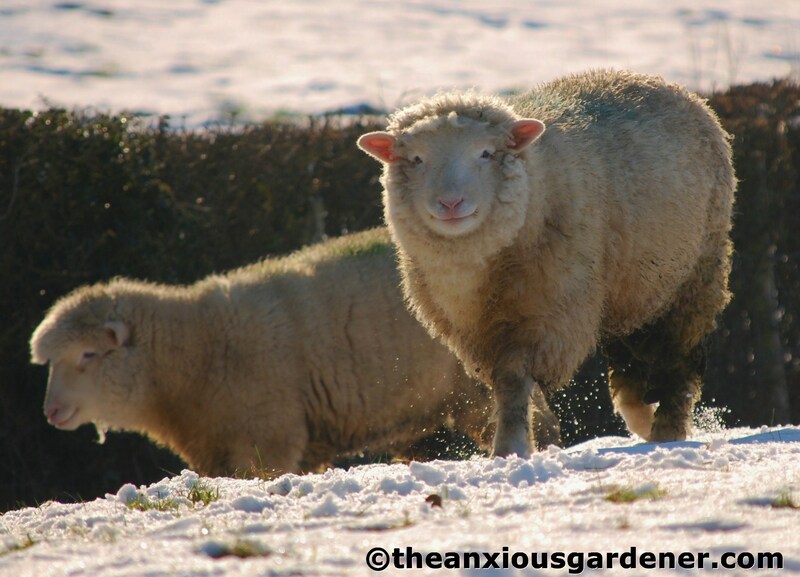 Margaret’s sheep struggle during heavy snow, and need to have food taken out to them in the fields. As if she hasn’t got enough to do. They did manage to find a small patch of grass, under the lee of a Priory hedge. The east pond was partially frozen but, thank goodness, after the unfortunate incident when Solo (the stinky terrier) ventured out onto the ice (chasing a snowball), broke through it and had to be rescued by Jim wading out into the icy water (brrrr – so brave) she now stays firmly on solid ground. I puzzled over the peculiar green shapes in the ice. 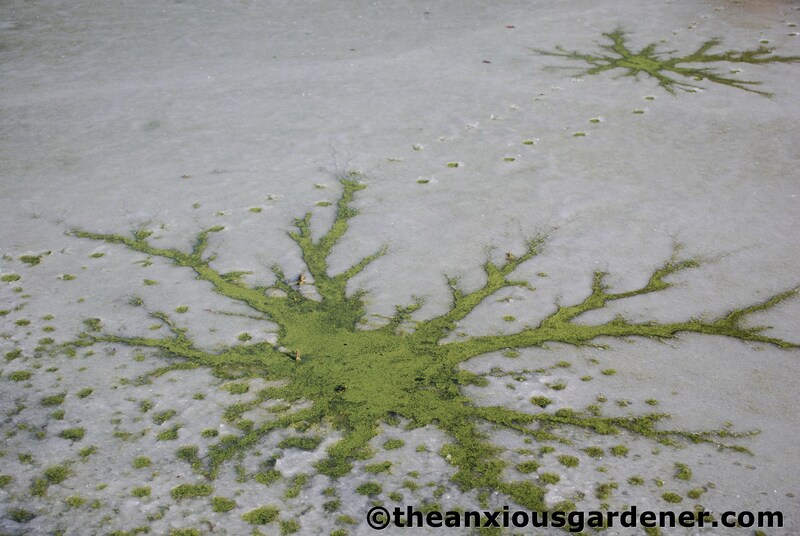 I think they are formed by mallard landing, breaking through the slush and thinking, “This isn’t very nice” and taking off again; duckweed then fills the gaps left behind. I think. Quite beautiful in a weird galaxy-ish, nebula-ish or neuron-ish kind of way. I’ve never seen anything quite like it. But I rather like them. 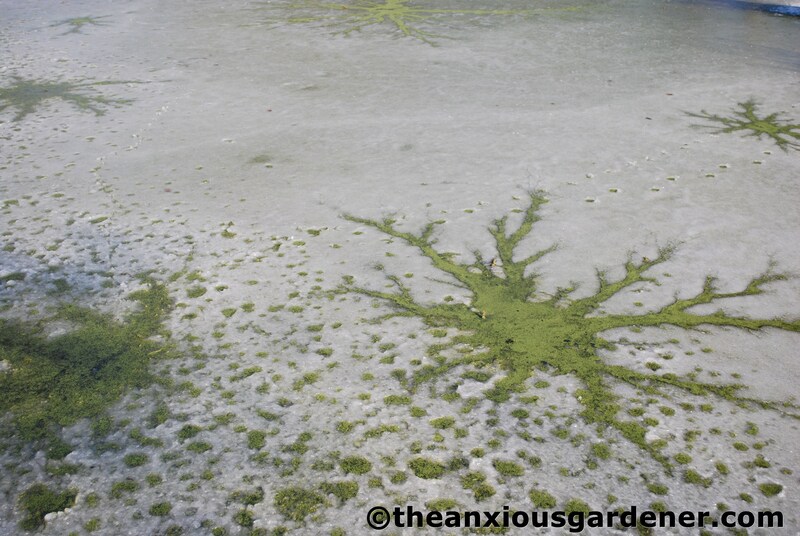 Those duckweed fireworks are amazing! You put some very funny pics there but you left me puzzled: how do you recognize Sussex Smiling Sheep from other Smiling Sheep? 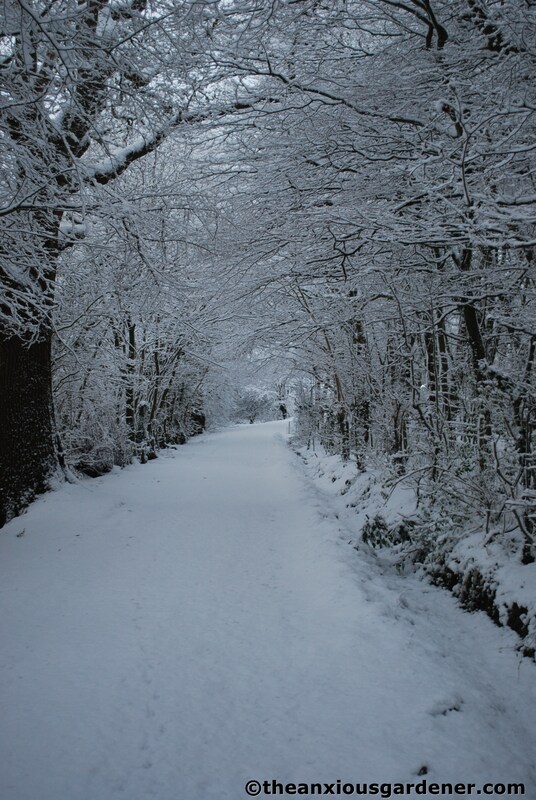 Your photos remind me why snow can be a good thing. And having a fresh snowstorm all to yourself—if you can discount the birds, foxes, rabbit (oh, definitely discount the rabbit), apparent heffalumps and woozles, and sheep—is a very good thing indeed. 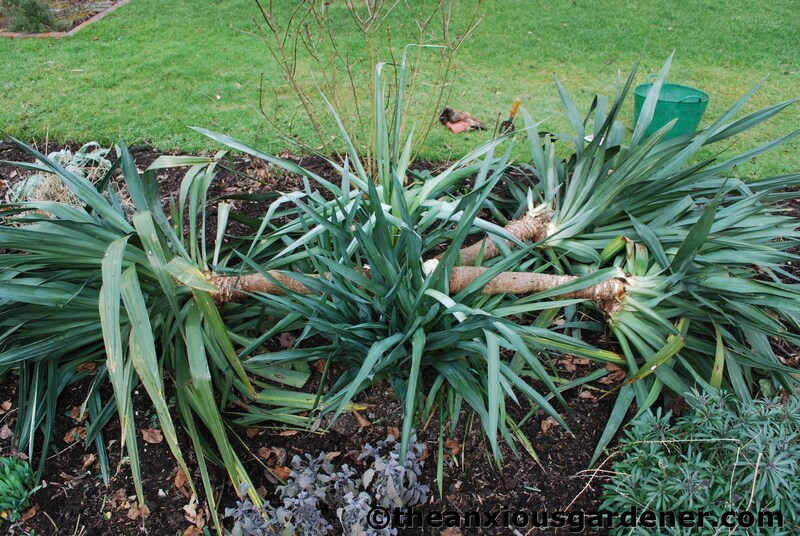 Hope the yucca survives with some dignity intact. Your neurons (well, not yours personally, not that there’s anything wrong with them, either, of course!) are fascinating. I’ve never seen anything like that before. Coruscating—what a wonderful word. Thank you for that one. It can go in the same sentence as marcescent some day. Interesting photos, and I loved hearing your thoughts about each. 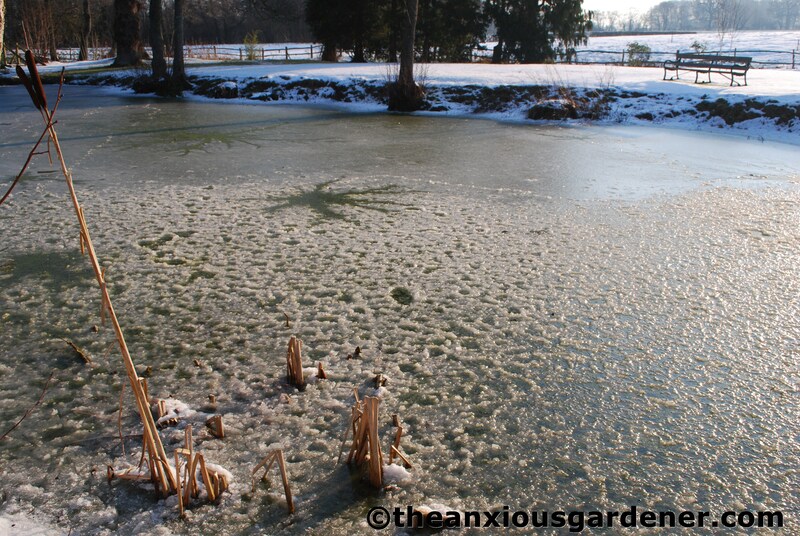 Yes, the green in the pond is strange, and the animal tracks tell a story. Laughed at the Lizard Man! I think you must have amused the sheep, too! 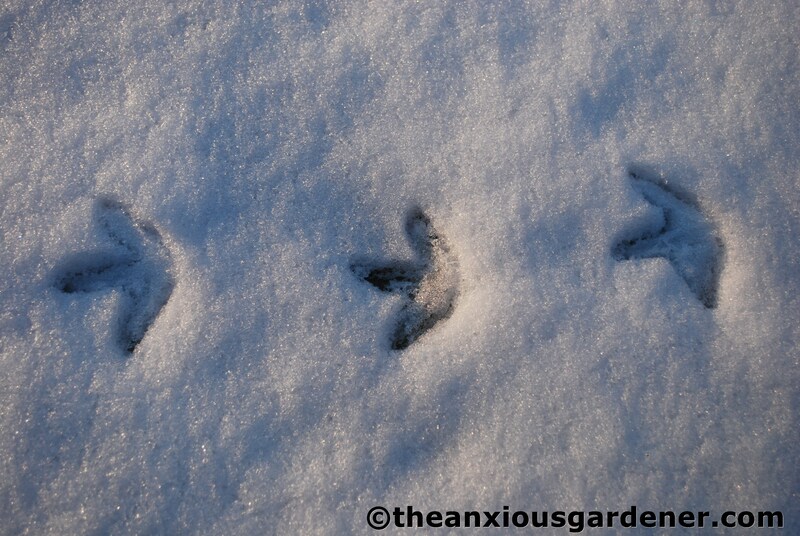 Challenging weather, Dave, but broadens a garden’s ( amd gardener’s ) scope! Great looking photos again David! 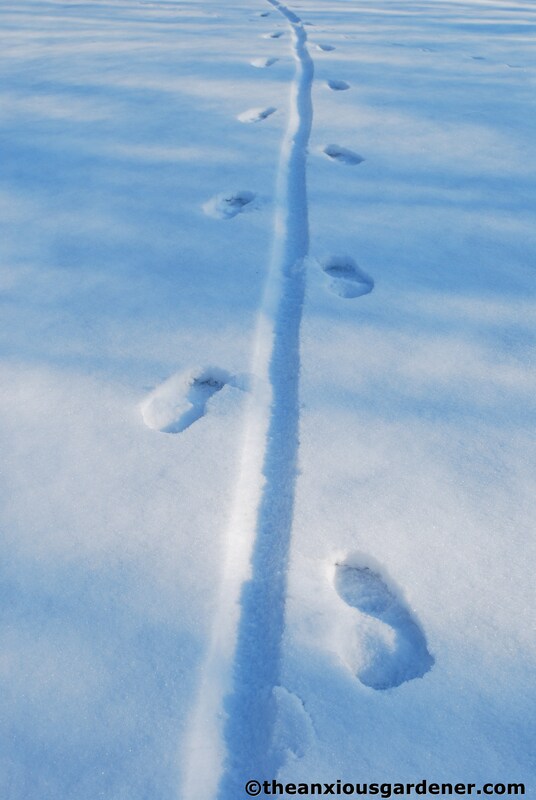 I don’t I’ve ever seen anyone else feature various footprints on snow before, strangely fascinating! The ‘smiling’ sheeps looks so endearing but my favourite is the duckweed milkyway, which you fortunately captured before the ice melted and the pattern disappeared. After posting this I saw some similar photos (sans duckweed) in a local mag with the explanation that they were caused by warm water dripping onto the ice, Not convinced – I blame the mallard! Great photos, David. It’s hard to imagine when you see tiny snow flakes that they can cause so much damage. 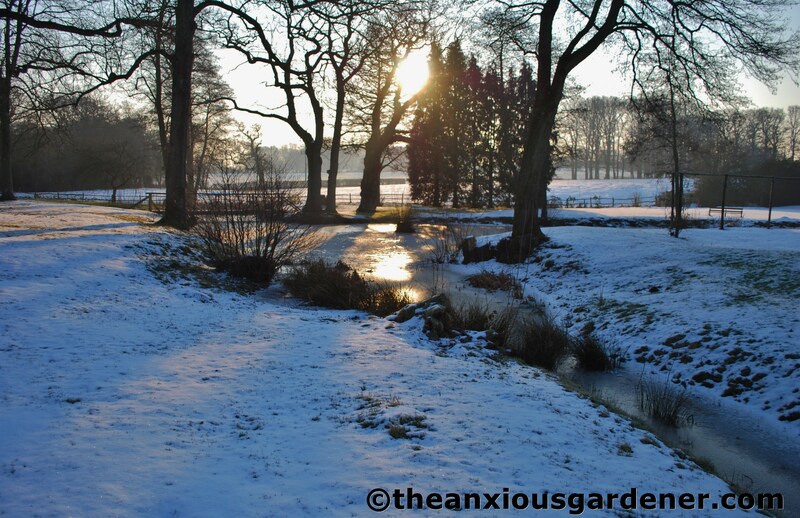 I love how snow transforms the landscape, well I love it when it’s all fresh and clean. I hate it when it goes all slushy and dirty. We didn’t get much at all here in south Wales this year. Enough so I didn’t feel left out when the rest of the country was getting it. The year before we had to go on a last minute dash to pick up our Christmas turkey. 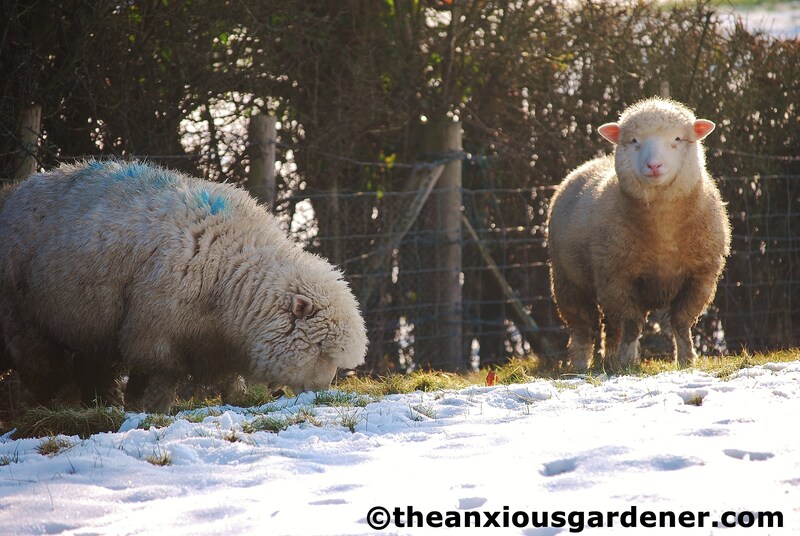 Our veg box delivery man was stuck in the snow so we had to meet him in a layby.! !Those are very smiley sheep, very sweet. I did actually get stuck up on the drive this year and spent half an hour trying to extricate myself. Was almost on the point of phoning Margaret to come down with her tractor to haul me to safety (the shame) when my car shot forward. Phew. Fab photos! I too love how snow transforms the landscape, makes it like a beautiful alien place. Here in Ireland we didn’t get any snow either, well, just a dusting now and then. I remember last year the brightness of the full Moon nights in the snow covered landscape. Just beautiful! We went for many years with hardly any snow but inland Sussex does seem to get a goodly amount. And under a full moon? Yes I’ve seen that – breathtaking, very Alan Garner. What a brilliant set of photos – I think you’ve missed your calling. The person following you round was definitely Charlie Chaplin. Love the smiley sheep and the last photos look like an alien invasion.